August’s fitness goal isn’t a fitness-goal per-se – it’s less about exercise and weight loss than it is about overall health. Despite my concerns about backsliding in July, I managed to keep the scale slowly moving downwards, getting in a solid but not stellar 4 workouts a week. I stuck to my 8 different kinds of exercise commitment too: running, strength training, ballet, hiking, swimming, cardio kickboxing, jump rope, and rock climbing. It’s fun to use your body in so many different ways. What I have not been so good about in recent weeks is keeping my stress levels in check. Work has been busy and time has been short, and I found myself teetering on the edge of illness three times in July. I know what works for my body – sleep, hydration, and mental down-time – but sometimes I fail to prioritize those things. So for August, I’m focusing on taking care of myself and giving myself room to breathe. Partly this involves 10-minute morning yoga sessions at least once or twice a week, partly it involves stretching and turning all the electronics off before bed, and partly it involves toting around big thermoses of herbal tea. I’ve also been toying with the idea of learning to meditate – I’ve never tried it, but like the idea. All together, these things do not make a goal, just a focus area: relax. In a way I’m giving myself a month off from rules – and that’s part of the point. This same mentality explains the quietness around here in the past few weeks. I love blogging, but some weeks it’s just too much to cook, shoot, edit, and write on top of everything else going on. This month I’m actively cutting myself some slack on the blogging front: certainly not giving it up, but also not beating myself up for delaying a post 1 or 3 or even 5 days from when I had originally planned it (this post being a prime example). That said, we have a gorgeous haul of garden produce this week, and I’m really excited to crank things up in the kitchen again – I’m currently experiencing a refreshing burst of creativity, and I can’t stop writing down recipe ideas. Most of these ideas seem to center around zucchini and summer squash, which are practically rolling out of our fridge every time we open the door. 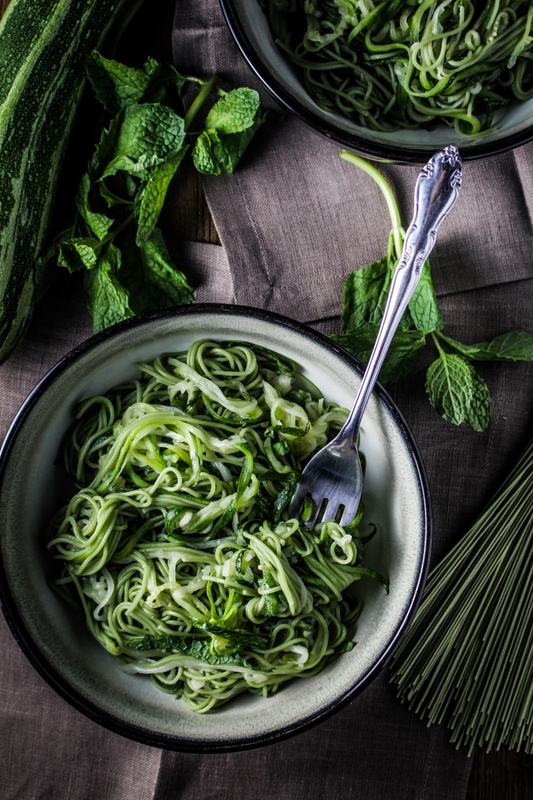 Zucchini noodles are a popular way of using up the abundant vegetable, but I find a bowl of raw zucchini strings a bit unappetizing. Mixed half and half with green tea soba noodles, though, I could eat a whole lot of it. I tossed this easy combination with an Asian-inspired honey-ginger-soy sauce and a few handfuls of sliced herbs, and Trevor and I gobbled it up. You could get creative and add sliced carrot, bell pepper, and scallions for additional flavor and crunch, but I wanted to keep this version all green. However you decide to spin it, it’s a healthy and refreshing summer lunch. In September we’ll be back to regularly scheduled programming – both on the fitness goals and blogging frequency front. Despite the fact that I’ve been out of school for three years, September still feels most like the time for new beginnings, and so August feels like the ramp-up period for that. Alternatively you might think of August as the last month of sunshine and lazy summer weekends before diving back into the meat of the year – so take the time to stop, breathe, and enjoy it. That’s what I’m doing. Zucchini noodles are a great way to eat lots of veg, but I can’t quite get over the feeling that I’m being tricked out of eating pasta, so I like to mix them 50/50 with other noodles. 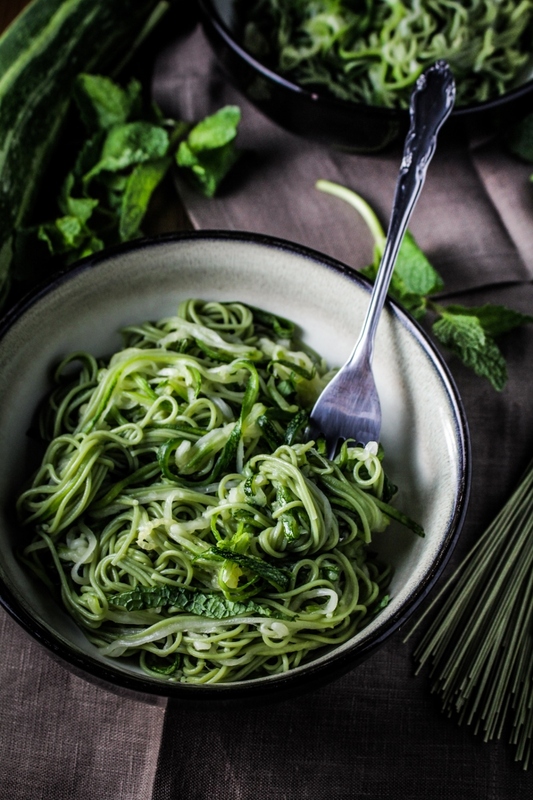 This quick recipes mixes zucchini noodles with green tea soba, honey-ginger sauce, and lots of basil and mint. Bring a large pot of salted water to a boil and cook the soba noodles according to package directions. Drain and set aside. 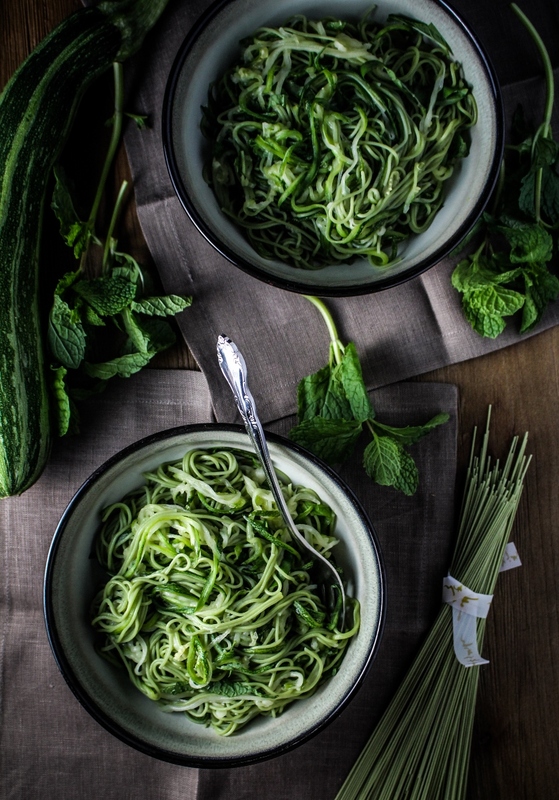 Use a julienne peeler to cut the zucchini into long noodles. 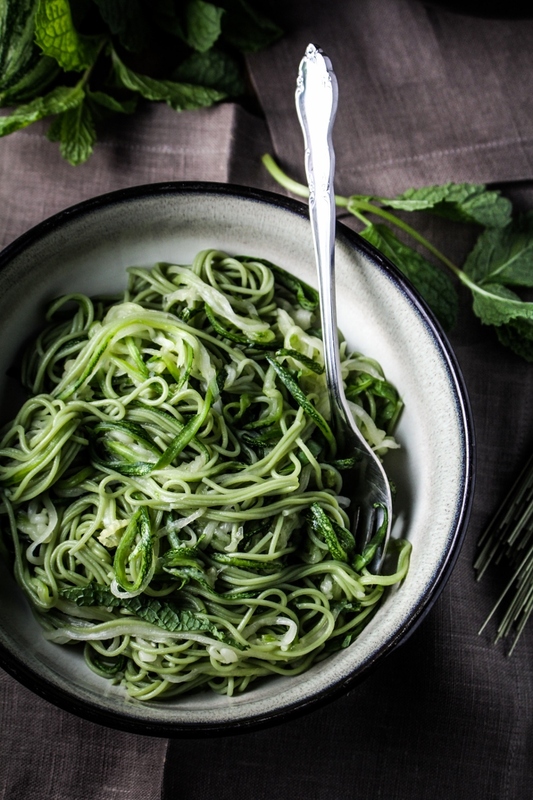 Place zucchini noodles in a colander and salt liberally. Place colander over a bowl and let drain for at least 15 minutes. Heat the olive oil in a small pan over medium heat. Add the grated ginger and grated garlic and fry until golden brown and fragrant, about 2-3 minutes, stirring constantly to prevent sticking. Remove from heat and stir in the sesame oil, honey, soy, and Meyer lemon juice until a smooth sauce is formed. Add the sauce to the soba noodles and toss to coat. I hear you about the rush of life and stress! My husband and I have been waiting for the “carnival” to slow down for three years now…ha. I think we’ve realized it’s a traveling carnival and although we may get a break between shows, the carnival keeps moving. I too get ill when I’m too stressed. I think many women suffer from that issue. Men seem to handle stress so much better than we do. Love this, it is so different! I’m going to put my mandoline to good use! What tool do you use to get the zucchini spaghetti so long and fine? It’s called a julienne peeler, and it’s like a vegetable peeler but with teeth. Mandolines are a bit fussy for my taste, so I like the simplicity of the peeler. definitely perfect for a light summer lunch. love the recipe, beautifully captured as usual too! Yum. I love that you mixed it up with noodles a bit. Not only does it add extra flavour, I love that it adds more green. The beautiful greens in this make it almost too beautiful to want to eat! Beautiful pictures of an original recipe! Surely it´s light and fresh, just like the pics suggest! 2 tablespoons of soy…what? Sauce? Beans? Paste? Sauce. Thanks for catching the typo! Made it; Liked it; Ate it! My sauce was a little too strong on mint. Next time, I would go with 2:1 basil to mint and a little more ginger. Good way to use up garden goodies in a satisfying dish! Going to make this tomorrow! Just a little confused about what to do with the zucchini after I slice it…all I do is salt it and then let it drain? It doesn’t get cooked or rinsed with any water? Thanks! Nope they don’t get cooked. Depending on how much salt you use, rinsing and squeezing them out might be a good idea – if you just squeeze them out they might be a little too salty. Where is the “green tea” that is in the name of the recipe? 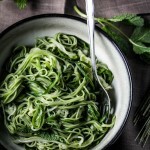 Oops re above comment.. just noticed that the recipe calls for “green tea soba noodles”. I’ve never heard of that.. I’ll have to look for it. Where did you get it? Thanks!